Trump tweets prototype of U.S.-Mexico border wall – Royal Times of Nigeria. U.S. President, Donald trump has tweeted a prototype of the construction work for the border between the United States and Mexico. Trump took to his handle: @RealDonaldTrump to share a 21 seconds video which showed cranes erecting large concrete slabs near San Diego in southern California. San Diego was chosen for the testing of prototypes because it does not have adequate border fencing, a U.S. official said..
Construction work for the border began in September. However, 8 companies are currently in the final round of bidding with the construction of prototypes. 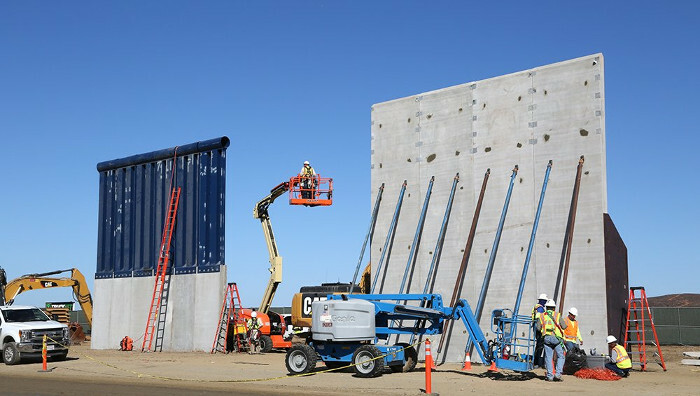 The U.S. Customs and Border Patrol agency (CBP) in San Diego has posted several photo updates on the construction of the wall models, built by several construction companies with various defensive features. Building a wall along the Mexican border to curb illegal immigration was one of the key promises of Trump during his campaign for the White House. Earlier in 2017, Ron Vitiello, acting deputy commissioner of CBP said that final selection and contract award will take place after a thorough review and evaluation of the prototypes constructed. A date for final selection and award of contract is however yet to be announced. A report by the Department of Homeland Security (DHS), obtained by Reuters, estimated that the fencing off of the entire border wall would cost $21.6bn and take more than three years to construct. The department has issued a budget that asks Congress to approve nearly $1.6bn for the wall in the fiscal year 2018.